My personal favorite is No. 5 — China as perpetual victim. How many times a day does the antiCNN clique turn to that one? In all seriousness, this reads like a laundry list of what my site’s trolls do, to the letter. Even those I don’t think are 50-centers, like yourfriend. In fact, was there any reason to issue these guidelines to begin with? I think they’re already common knowledge among those assigned to make mischief in blog and portal comments. I already wrote about the 28 movies commissioned by the Chinese government to celebrate the 90th anniversary of the CCP, a date that will live in infamy for all of us to cherish. Now, as the premiere approaches, we get to see just how far they will go to make sure Chinese citizens watch it, guaranteeing in advance it will be a blockbuster success without a single negative review in Mainland China. The movie, which opened on Wednesday on almost all of the country’s 6,200 screens, is part of a campaign to commemorate the 90th anniversary of the founding of the Chinese Communist Party next Friday. It is also playing in 29 American theaters, including ones in New York and Los Angeles. How ironic can you possibly get? A film celebrating China’s liberation that the Chinese are essentially forced to see. A government effort that squelches critics’ freedom to write what they choose. An exercise in such blatant propaganda that most of the world blushes in embarrassment. A movie designed to snap the people back to their senses and force them to love their authoritarian government. A movie that defy common sense. As the party moves ever further from its roots – the new film is co-sponsored by Cadilllac – it exploits them to bolster its relentless, Leninist grip on political power. “This is an absurd era,” Professor He Bing of the China University of Politics and Law told graduates in a bold speech this month. Needless to say Beginning of the Great Revival deifies Mao, “portrayed in soft-focus lighting as a trim, dewy-eyed and idealistic young man prone to slow-motion frolicking with his beloved in the snow.” It sounds like your typical CCTV fare, protracted to ensure maximum mind numbness. And what does the CCP stand for today? What about it should we celebrate? Despite some of the good it has brought to China since opening up, it nevertheless remains a giant squid, tentacles reaching across the nation to restrict all aspects of life in the land it liberated, silencing opposing voices and existing solely for its own perpetuation. Celebrate away, while people who know real freedom snicker. The CCP has outdone itself this time, and once again has made a laughingstock of itself. The release of Mr. Ai, 54, who is widely known and admired outside China, appeared to be a rare example in recent years of China’s bowing to international pressure on human rights. Mr. Ai was the most prominent of hundreds of people detained since China intensified a broad crackdown on critics of the government in February, when anonymous calls for mass protests modeled after the revolutions in the Middle East percolated on the Chinese Internet. China’s move to douse any flicker of dissent was the harshest in many years outside restive ethnic regions in the far west, and the vast majority of those detained in the crackdown were, like Mr. Ai, held in secret locations for weeks with no legal justification. Chinese officials announced in May that the authorities were investigating Mr. Ai on suspicion of tax evasion, after police officers took him from the main Beijing airport on April 3 as Mr. Ai prepared to board a flight to Hong Kong. Supporters of Mr. Ai said the tax inquiry was a pretext to silence one of the most vocal critics of the Chinese Communist Party. It is reckless collision against China’s basic political framework and ignorance of China’s judicial sovereignty to exaggerate a specific case in China and attack China with fierce comments before finding out the truth. The West’s behavior aims at disrupting the attention of Chinese society and attempts to modify the value system of the Chinese people. Ai Weiwei likes to do something “others dare not do.” He has been close to the red line of Chinese law. Objectively speaking, Chinese society does not have much experience in dealing with such persons. However, as long as Ai Weiwei continuously marches forward, he will inevitably touch the red line one day. Tax evasion indeed. I am thrilled he has been released. Let’s not forget, however, that there’s a long list of other less high-profile “tax evaders” who remain in custody. Amnesty International is calling for the immediate release of Ai Weiwei’s four associates Wen Tao, Hu Mingfen, Liu Zhenggang and Zhang Jinsong, who all disappeared into secret detention after Ai was detained. Ai Weiwei is one of over 130 activists, lawyers, bloggers and tweeters detained since February in a sweeping crackdown on dissent prompted by government fears of a ‘Jasmine Revolution’ inspired by the Middle East and North Africa. Canadian Troy Parfitt, an English teacher in Taiwan for ten years, believes passionately in the title of his new book, Why China Will Never Rule the World. “China, China, China: it seems it’s all you ever hear these days,” he laments. His book, part travelogue, part tome, argues, at times persuasively, that a country that clings to Confucianism, Legalism, totalitarianism (his claim, not mine) and education by rote memorization can never, ever be the word’s No. 1 superpower. As I read the book, which Parfitt sent to me, I had all sorts of thoughts. Thoughts like, Oh my god. And, Is he really saying that? First let me say that despite all my problems with this book, I recommend you read it, if only for the beautiful writing, attention to detail, the delightful anecdotes and some thought-provoking questions it raises about China’s future. On the other hand, I was appalled at Parfitt’s attitude toward both China and Taiwan. In spite of his finding some things to praise about each, it is more than clear from the very start that he harbors a good deal of contempt toward both countries. Let’s look at the book’s attributes first. It’s written as a travelogue of the writer’s extended trip through China. Wherever he goes, Parfitt recreates the scenes with large frescoes that then go into the finest details, giving you such vivid imagery you feel like you’re there, and the pages turn by themselves. It immediately brought to mind Simon Winchester’s travel diary, The River at the Center of the World (which I reviewed some years ago here). Like Winchester, Parfitt is a wonderful spinner of yarns; the book is really a string of anecdotes laid end to end, but Parfitt is a good enough writer that it all holds together quite well. Here’s an example of his writing, a depiction of a cruise up the Yangtze in a boat with 40 tourists. The immense hills that guide the river grew dim, becoming featureless masses which rose up at intervals to lick the thinning strip of hazy blue which hovered just above. Overhead, the sky drained itself of color. It turned wine dark and offered a pair of glistening stars for consideration. Before long, we were moving atop an onyx slate dotted with visual echoes of extinguished suns. Lengthy stretches of nothingness were punctuated by towns and villages that appeared in the distance as bracelets and pendants. Our searchlight remained fixed on the southern bank, illuminating man-made bits and pieces (a window pane, a guardrail) within a circle of murky green. When the horn sounded, 80 hands shot up to cover as many ears. Nice. And that’s just a random paragraph. He has also done a remarkable job researching every location he visits, and offers an engaging overview of Chinese history that the layman will find quite useful. As for the lake itself, it was just a lake; steel grey and surrounded by dim brooding hills that were marked by pagodas. Having grown up minutes from a whole host of lakes that were much finer, not to mention free of man-made objects, I failed to see what all the fuss was about. I suppose we all have our own opinions. My own is that Xihu is one of the world’s most gorgeous, enchanting natural wonders. And it’s not “just a lake.” It’s some of the most lush and beautiful scenery on earth, surrounding a magnificent lake with breathtaking hills behind it, creating a perfect and serene balance of nature. Does he want to see Hangzhou’s beauty? Unsurprisingly, upon arriving in Beijing, the first things he deems worthy to comment on are the spitting, a car that nearly hits a pedestrian and the brawl that ensues, and the people’s general unfriendliness. Beijing residents, or Beijingren, are not the world’s softest, most cuddly people. China, after all, represents the cultural center of China. The capital’s inhabitants are notoriously conceited, strident, aggressive and obtuse. They seem to be in constant possession of a horseradish temper and appear to like nothing more than a good argument. They absolutely have to have the last word, and they smoke and spit like there’s no tomorrow. Alright. This so flies in the face of everything I know about Beijing, I simply can’t understand where he’s coming from. I and all my friends in China love Beijing in large part because the people are so wonderful. They are nearly the exact opposite of Parfitt’s description. He then spends a lengthy paragraph telling us how popular and gruesome public executions in Beijing used to be, how awful the audio tour of the Forbidden City is, and how Beijing taxi drivers don’t know where anything is. This is a recurrent theme in the book; wherever he goes in China, no one knows where anything is. And no one wants to be responsible for anything. Certainly this rising superpower, this fearsome dragon, this nation that was supposedly shaking or on the cusp of shaking the world, had a slogan, this would be it: meiyou banfa. There’s nothing that can be done. You can actually see people mentally moving toward it. It’s like a goal that, once attained, alleviates one from all responsibility. There’s some truth to this, of course. Anyone who’s worked with Chinese companies, for instance, knows that there’s a natural inclination to pass the buck and avoid responsibility. Better someone else be accountable for it if something goes wrong. But there’s much more to the Chinese than that. My friend Lisa and I recently traveled through Guizhou and when we got lost and asked for help, people didn’t just tell us where to go, they took us there. These sweeping generalizations about the Chinese, all negative, every single one, soon wore on me. China was, pure and simply, a totalitarian state, and those who advocated an alternative tended to deny the obvious: communism fit China like a glove. It was Legalism, Confucianism, feudalism and the teachings of Lao Tsu all wrapped up into one, which is to say it represented a potent and frequently lethal blend of a number of native ideologies that were in and of themselves highly toxic and remedies for disaster. The essence of his argument is that China’s future will be determined by its past, and that that past precludes China from ascending to international leadership. China cannot integrate with the world, cannot give up its obsession with harmony and control of its people’s minds through rote memorization and propaganda. He comes to the conclusion that China does not want change. Along with Lu Xun, one of the author’s heroes is Bo Yang, the Nationalist Party member who believed China’s only path to greatness was to embrace Western civilization and who wrote The Ugly Chinaman and the Crisis of Chinese Culture to stake his claim. In one of the most outspoken parts of the book, Parfitt delves into Bo’s worldview. It’s hardly surprising that Bo Yang is Parfitt’s hero — this is coming from the mouth of a Chinese intellectual, not an obnoxious foreigner, and it’s much harder to dismiss it as “anti-China” propaganda. All of this makes for compelling and thought-provoking reading, mainly because Parfitt makes his argument so well. For all my irritation with his negative tone and broad generalizations, there were definitely many times when I found myself agreeing with him, especially about education and propaganda and the lack of eagerness to embrace meaningful change. One of the things I liked least about this book was a little game Parfitt enjoyed playing: approaching Chinese people, engaging in discussion with them and then ambushing them, asking what China, or Confucius, have to offer the world. He seems to enjoy putting these people on the spot and watching them squirm. One of these discussions takes place with a director of Canada’s Confucius Institutes, and I truly felt for her. When he asks her, “What does Confucius have to teach non-Chinese and non-Asian people?” she responds, somewhat predictably, with a single word, “Harmony,” the reason why China was able to enjoy “5,000 years” of peace and stability. Why is he doing this? He already has come up with his own answer to the question, which is Nothing. In Nanjing he walks up to some young people, strikes up a conversation and then asks, “What’s an aspect of Chinese culture that the West ought to copy?” (Isn’t this kind of rude?) They had no answer, which is the answer Parfitt wanted them to have. But here I need to throw in another “On the other hand…” And that is, Is there another answer to Parfitt’s question? What should the West copy? It’s not an invalid question; I just don’t like the way Parfitt asks it. In the last section of the book, Parfitt’s animosity toward China reaches over the Straits to embrace Taiwan, his home for ten years. He praises much of Taiwan’s natural beauty and does not deny the many charms of living in Taipei. But he spends far more time on the negatives – the Keystone Cops-like Taiwanese police, the political fistfights, the bad driving, but especially the education system, which he sees as nearly as awful as the Mainland’s. (Which begs the question, “What was he doing teaching there for ten years?” He never tells us.) While he acknowledges Taiwan’s huge strides forward since the 1980s, he still seems to delight in making fun of the country. What Troy Parfitt comes to sound like…is a bad traveler, an insensitive loud-mouth ranting on about the absurdities of life “abroad.” As his epigraph he quotes a sensible sentence from Samuel Johnson that points out that travel allows you to modify fantasy by exposure to the real thing. The assault on Asian ways of life that follows – and the same treatment Taiwan receives is handed out, at lesser length, to the other Asian countries the writer visits – consequently comes as an even greater surprise. By this point, if you’ve managed to make it this far, I suspect you’re wondering why I’d bother to write such a long review of a book like this, and why you should ever bother to read it. The answer is, as I said at the beginning, that Parfitt has done an amazing job in collecting and tying together hundreds of great anecdotes, combined with a good deal of history and political analysis, to create a highly readable and even enjoyable book, despite the parts that caused my blood pressure to rise. I actually think you would find it worth the time (I finished all 400+ pages in two days), and you’d definitely find yourself laughing at his trials and tribulations in China. A most interesting experience. I’m glad I read it. You can see a video of Parfitt discussing his book here. And yes, I know, this post is much too long. Apologies. 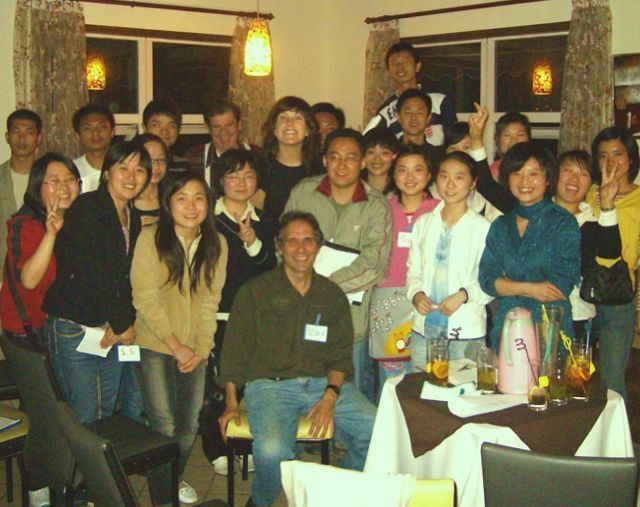 Back in 2002, a few months after I started working in China, I decided to give a training session to my staff on creativity and visualization, two qualities that are quite useful in public relations and brainstorming. Earlier I had given trainings on responding to a crisis, using blogs to generate media coverage, how to write a press release, etc. The trainings were well received and I got a lot of thanks from my colleagues. I never gave that training again in Asia, though I’m not convinced she was totally correct. This brings me to an utterly charming book I just finished, Peter J. Vernezze’s Socrates in Sichuan: Chinese Students Search for Truth, Justice, and the (Chinese) Way. (This book was sent to me by the publisher.) I related the anecdote above because it was the first thing that came to mind when I saw the title of the book, the memory of my boss telling me philosophy was of little interest to Chinese people. I was curious to see if this were really the case. Vernezze is another Peace Corps volunteer who, in the Peter Hessler tradition, chronicles his experience teaching college students in Sichuan. (The other great book on China by a former Peace Corps volunteer is Michael Meyers’ superb The Last Days of Old Beijing.) Vernezze, who had taught philosophy in the US for 15 years, was an English teacher at Sichuan Normal University, and for two years he held a weekly discussion group on philosophy that grew increasingly popular. Being neither a “china expert” nor a philosophy expert (one semester in college), I found this book offered both a valuable primer on the influence of Confucius and the Tao, which is going strong to this day, as well as an intriguing glimpse into the mindset on contemporary young Chinese people. The author starts by describing the typical university classroom: rows of desks bolted to the floor, all facing the front-center of the room from which the professor will lecture them. The room is designed to discourage peer-to-peer discourse, and as Vernezze later explains, peer-to-peer discourse is something the Chinese student absolutely does not desire. They see themselves, he writes, as vessels into which the professor is expected to deliver his knowledge. They aren’t interested in what their fellow students have to say. Anything of value will come from the teacher. So it makes perfect sense that he holds his philosophy discussion group in local coffee shops where students can sit facing one another. There, he challenges them with questions such as What is Truth? What is Sanity? Is life a matter of fate or free will? How Vernezze draws his students out, and the stumbling blocks that challenge him, makes for excellent reading. The one trend that permeates nearly every chapter (and one that you’re probably all at least somewhat familiar with) is the almost reflexive need for his Chinese students to find a “middle way,” an answer to his questions that take into account all sides, so the answer they give won’t hurt anyone or cause them to lose face, including the teacher. This is the very opposite of the approach of US students, who form strong opinions and argue them with passion. The principle that “there are two sides to every coin” applies to nearly every answer the students offer throughout the book. Life is about finding a middle way, and Vernezze does a masterful job of linking contemporary Chinese attitudes with the teaching of Confucius and the Tao. I wasn’t sure how many people died in the American electoral process in the past two hundred years, but I was pretty certain it was significantly fewer than the three million some historians estimate perished during the Cultural Revolution Which is not to say that he did not have a point. No one doubts the American political system is broken…. This wry humor finds its way onto nearly every page. And every exchange he relates takes us deeper into the minds of his students, whether they’re discussing the government’s suppression of the 2008 riots in Tibet, the attack on the World Trade Center, the Sichuan earthquake or even homosexuality (he is amazed at how tolerant his students are on this issue). The very notion of credit cards — that you would spend money one didn’t have — horrified most of the students. This attitude seemed to me not merely the result of a culture of saving but indicative of a philosophical worldview that is profoundly different than the Western one. I would argue that the very idea of the credit card has a particularly American flavor to it, embodying an attitude of optimism. Since Americans are certain that the future will be better than the present, we feel comfortable spending money we don’t have. By contrast, the Chinese idea, which finds its philosophical basis in Taoism, is that because reality is in a constant state of flux — the young becomes old, hot becomes cold, what is hard is broken down into what is soft — one should take no course of action that makes overly optimistic assumptions about the future. Say what you will about this attitude, but I can tell you this: no Chinese would have taken out a mortgage that he knew was going to balloon in a few years on the hope that he would be able to refinance at the time based on the value of the house. …if the existence of laws in the physical and psychological realms does not require the presence of a spiritual reality, it should come as no surprise that for both the ancient Greeks and modern Chinese, the fact that there is only the natural world does not preclude the presence of a moral law. Indeed, in both traditions ethical laws for regulating human conduct have the same status as laws of of physical and psychological health; they are relevant and sought out by the intelligent person wishing to have a good life. While I’m quoting a lot about the theory, the actual magic is in the characters who attend the discussion group, how they interact with the teacher and their peers, and how they grapple with logic, the very nature of which goes against how they were taught to learn (rote memorization vs. inquiry and discussion). Often the most fun part is when the students offer responses that are so not what the teacher expected to hear that his own belief systems are challenged, and he is forced to think in a whole new way. Finally, it’s a great bird’s eye view into teaching in rural China, many years after Hessler wrote River Town, the gold standard on the subject. Much has changed, while a lot has remained the same. Again, I’m no philosopher, so I may not be able to engage on all the issues I’ve raised. If you have questions or are curious about any of the points mentioned, get the book. And in answer to the question I posed at the beginning: this books shows the Chinese can indeed engage in philosophy, though in a much different way than Westerners. They are willing to explore tough issues, and in the hands of a competent navigator like Vernezze they can even broaden their worldview while learning much about themselves that they hadn’t given thought to before. It’s a book I highly recommend. Thanks for making it through a review that is somewhat all over the place. I need to find the middle way and not write such long posts. The always dependable Xujun Eberlein has a short but moving post celebrating the release from jail of Beijing attorney Li Zhuang who dared to defend an alleged Chongqing “gangster,” a label that applies to anyone who dares oppose Chongqing Committee Secretary Bo Xilai. But before we break out the Champagne over Li’s return home, Xujun reminds us of how the law is carried out in China’s fastest growing municipality, and why it’s way too early to celebrate. While Li Zhuang is finally home, a Chongqing citizen, Fang Hong, was sent to labor reform for mocking Bo Xilai’s handling of Li Zhuang. Fang also has a supportive and filial son, Fang Di, who hired a renowned lawyer, Yuan Yulai, for his father. Yuan Yulai is reputed to be most interested in cases of “citizens suing officials.” A couple of days ago Yuan wrote on his micro-blog that Fang Di and other family members have disappeared after being summoned by police to talk. It’s in the last paragraph that Xujun lets it all out. Fang Hong’s arrest shocked me more than Li Zhuang’s trial, for even the appearance of legal procedure is abandoned. It is a stark naked case of “speech crime.” If I had had any illusions about Bo Xilai before, like the first time when I saw his handling of Chongqing’s taxi strike in 2008, Fang Hong’s arrest was the last straw to convince me Bo is a ruthless politician believing in Mao style iron-handed rule, and a political gambler who stakes all on a single throw. I just don’t know, 35 years after the Cultural Revolution ended, how far Bo can go in today’s China. Who’s the gangster here? There are several more posts over at Xujun’s blog on this depressing topic. I hope everyone reads them. They serve as a grim reminder that rule of law has a long way to go in China, where you can still disappear at the whim of an official, and where those on the top are accountable to no one. And keep your eye on Chongqing and Bo Xilai. Is his hearkening back to Mao the sign of an ominous trend, or it it an isolated aberration? Would you pay to see these movies? Jian Dang Wei Ye (Beginning of the Great Revival, or The Founding of a Party), a movie chronicling the history of the Communist Party of China (CPC), premiered in Beijing on Wednesday. It is among 28 movies promoted by the State Administration of Radio Film and Television (SARFT) to celebrate the 90th anniversary of the CPC, the Xinhua News Agency reported. ….The movie is one of the films promoted by the SARFT for the Party’s anniversary. Tong Gang, director of the SARFT, said at a promotion event on Tuesday that SARFT had selected 28 movies for recommendation and added that these movies serve as a report that the Chinese movie industry has submitted to the CPC and the Chinese people, according to Xinhua on Wednesday. The 28 movies include a profile of Qian Xuesen, CPC member and pioneer of Chinese missile and space projects, a movie depicting the rebuilding of the quake-hit Beichuan in Sichuan Province and a movie about the development of the J-10 fighter jet. Tong asked the distributors to “be highly aware of the films’ political and social responsibilities” when showing the movies. Twenty-eight propaganda movies to celebrate a birthday no one gives a crap about except the birthday boy. That’s probably about 60 hours worth of propaganda. Can you imagine being forced to watch 60 hours of CCTV? Because I suspect that’s what it will feel like. And Tong is basically admitting this is pure propaganda. Will the Chinese people really flock to see these movies? I think virtually every expat in China who returns home on vacation goes through the same culture shock when they get back to Beijing (or wherever): there is that jolt of not being able to get onto a web site that loaded instantly while you were away on vacation. All of a sudden, the bliss you had experienced of getting onto Gmail in a fraction of a second goes up in smoke as you watch the page opening sloth-like, ever so slowly, if it doesn’t time out altogether. No matter how many times you go back and forth between China and home, returning to China’s Internet still ignites a burst of annoyance and frustration, especially since it seems to be getting steadily worse. No, this is nothing new. I think the newest aspect of the GFW is its focus on Google/Gmail. I was stunned when I visited China a few weeks ago and waited and waited for my email to show up. But now, after Google’s complaints of new China-based hack attacks, it’s gotten even slower, if that’s possible. And they’re messing with your VPNs, too. China, the country going through such marvelous reforms, wants to torture visitors to foreign sites and block anything they’re afraid might be inharmonious. And the key word is “afraid.” You only take such Draconian measures when you’re scared shitless. We just returned from two weeks in the “Free Internet Zone” known as New Hampshire to find that things online in China are as bad, or maybe worse, than ever. * I use a VPN too much to access materials that the man-purse brigade who run things around here finds objectionable. This could be anything from “Wen Jiabao in a Poodle Skirt” to accessing overseas libraries and journals on Chinese history. * After a period of time, VPN stops working. Upon turning off the VPN, I find that while Chinese sites load normally, ALL foreign websites – no matter how benign – are now blocked. * After a short “time-out,” things get back to normal and I can then view overseas sites and use the VPN again. ….For me personally, this is all more annoying than anything else. Eventually the VPN kicks in and I’m able to get work done. It might take a little longer, but it is what it is. But this obsessive need to control information also speaks to a larger truth: No matter how well China is doing or how satisfied people are with their lives, the Chinese government consistently acts like the once-cuckolded husband who can neither forgive his wife nor forget her fling…even after 22 years of relatively good times. Read the whole thing for some good laughs. What makes it so depressing is that it’s so unnecessary and does nothing to make China look good. I also doubt that if they lifted the block there would be revolution. Like in the days of Stalin, the CCP has to keep reminding the public who’s in charge lest they get any ideas…. It is better to be feared than loved. After my last post about People’s Daily, at least one reader asked me via email why I bother posting about articles in the Chinese media that rail against the West, since they are so consistently preposterous. And the reader has a point. These columns from People’s Daily and Global Times and China Daily tend to repeat the same tiresome theme, namely that the West is determined to make China look bad, to undermine the CCP, to somehow harm China. These memes become ingrained in the Chinese psyche (not across the board, of course) and are echoed in countless blog posts and comments and message boards. I know entire blogs (or at least one) that seem to focus solely on this theme of China’s victimization. So why bother? First of all, being a media junkie I find the explosive responses infinitely fascinating, I admit. More importantly, I believe contemporary China can’t really be understood without having insight into this phenomenon, without understanding the raw sensitivities of so many Chinese people (especially the young). I had to deal with this mentality on a daily basis when I was living in China. My young colleagues truly believed Anti-CNN was gospel, and that the US media, in partnership with the US government, actively conspired to defame China and make it look atrocious, with the ultimate goal of stymieing China’s growth and keeping it weak and under the control of its former imperialist masters. This sentiment is real. Which is all a long way to build up to today’s atrocity from People’s Daily, highlighted in a most interesting piece in the NY Times. Looking at it today, I saw another reason why documenting these stories is important: they reflect a growing hostility and brazenness that has deep implications for China’s future relations with the West. Needless to say, revenge against Google was swift. In the days after Google’s latest accusation, Chinese users of Gmail and the popular Google Maps service have seen connections slow to a crawl, while the same services accessed over private networks have remained trouble-free. Chinese officials have attributed Google’s service problems to technical issues that do not involve the government, and they have denied any government role in hacking Google computers or e-mail accounts. Google had little to gain by making these accusations. It has already seen its market share trounced by Baidu, especially since its accusations against Chinese hackers last year, and I think they’ve been resigned for a long time to being number two (or lower) when it comes to Chinese search. As the NYT article says, however, they’re making their profits in China from advertising, with revenues growing year over year and a staff of 500. I see no reason why Google would make these accusations if they weren’t fairly certain they were true. At this point, what’s in it for them? Was the Chinese government behind the attacks? I don’t think anyone can say for sure, but there is certainly plenty of circumstantial evidence (just look at the list of those who’ve had their gmail accounts hacked). The big surprise: This story made front-page news. It’s pretty much an open secret. Every correspondent in China knows it. And yet whenever it’s brought to light the Chinese media goes into paroxysms of rage and finger-pointing, to the extent of accusing Google of trying to sabotage US-Chinese relations. This is what amazes me and is why I bother to write this sort of thing up: it’s the sheer vitriol of China’s reaction, dripping with veiled threats, and their need to put this on the front page of their newspapers. The lady doth protest far too much, methinks. This post is a bit all over the place, but I think you get my point.